In every organization or institution there are rules that must be followed. When those rules are broken, there are consequences - a disciplinary process is adhered to. Many have guidelines set out in such a way that when the rules are broken by an employee the first time, s/he get a verbal warning. The second time around you are given a written warning. The third time around, hey, you are likely to get fired right? That's when employees break the rules. But what happens when the leader himself do not adhere to the standard rules, or when his leadership style is not only challenged, but protested against? Who is he accountable to? Who takes disciplinary actions against him and who really fires the leader? What should really happen when that leader happens to be the church pastor, and presumably, the church bi-laws were not adhered to but yet he gets fired? Does God want us to take matters into our own hands? That may be the case with one church pastor, as tensions ran high at a north Charlotte church this past Sunday morning. According to The Charlotte Observer, church members at a Charlotte, N.C., church are protesting a pastor's leadership, saying he was fired months ago but won't leave his post. 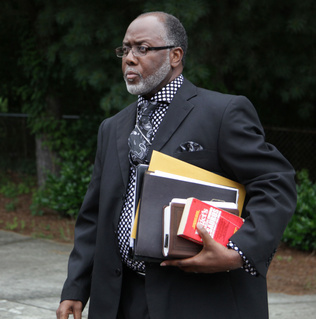 The pastor, Andrew Rollinson (pictured above) of Morningstar Baptist Church in North Charlotte, says he has no intention of leaving because the process the five church leaders used to fire him did not follow the church bylaws. "I'm the pastor. I will be the pastor until people want to follow the bylaws," Rollinson said. "This is a group of irate individuals who want what they want and are not able to get it according to the bylaws, and they become irate." Although Rollinson did not say how members violated the bylaws, he said he has no intentions of leaving the church. The letter to Rollinson is said to be dated April 28th and signed by five church leaders read in part, "Due to his character that is not becoming of a pastor, his dishonesty, controlling demeanor, using the pulpit to disrespect his members...we are removing Pastor Andrew J. Rollinson from his duties effective immediately. May God continue to bless you and your family and we hate things had to end this way." This past Sunday morning, police were alerted and were parked outside the church before opposing sides of the argument faced one another before the service began. No one was arrested, and after a couple hours of shouts and protests, the two sides seemed to call a truce and go inside the building for services. Jackie Black, chairman of the church's board of deacons, said the drama has distracted members from the church's vision. He also said he will involve the church's attorney in drafting the pastor's contract in the future. "We're going to make sure it's very specific so nobody can take advantage of us again," he said. It is still not clear of the final outcome but my last questionable thoughts are these, are we as members of the body of Christ (church) responsible for placing our spiritual leaders and pastors on a pedestal or in a high place where there is not the grace of God available to keep them? What are the lessons to be learned from this as leaders and or church members? This makes me so sad! I've been a part of a church where there were serious conflicts with membership and the spiritual head. It causes division and can drive people away from "organized" religion. I appreciate your openness to discuss this. Indeed it is really sad and I agree it causes division, and serious conflict. It even seems like we are made a "laughing stock" especially by non-Christians - we cannot draw them into the body of Christ/church if this is the kind of behavior being displayed by the people who call themselves Christians. This is a shame, and I'm very sad that this church is going through these issues. Why stay in a location where the people don't want you there? Why continue to sit and listen to someone who you feel is not the best leader for you? These are questions that I don't know the answer to honestly. I really do hope they resolve these issues. Something like this can eventually turn a person away from organized religion, like Michelle has mentioned. Hi Kalley your questions were also my train of thought as well and while we may not have the answers, God have them all. Rejection from what I understand is a curse..so as you quite rightly said, why stay among the people when clearly the voices are saying they don't want him there anymore. I hope that matter get resolved soon rather than later and people can forgive each other in love and move on with their lives.